Did you even know such things existed! This is the Beer Cheese Festival's 10th anniversary! Ask almost anyone what the best part of the Beer Cheese Festival is, and they’ll tell you, “Sampling beer cheese!” and they’re right. We start at 10:00 am and go all the way to 5:00 pm. You can sample beer cheese from any of our vendors. Sample them all. Find your favorite. Cast your vote. You can even purchase beer cheese right from the vendors. When you need a break, there are plenty of other things to do at the festival–listen to live music, drink from the beer garden, visit arts & crafts or Kentucky Proud booths…and then you can head right back into the beer cheese section, and try some more, because at the end of the day it’s all about the beer cheese! Have you heard of this business? Cinderella's Attic located in Warsaw, KY. Read this sweet letter from one of the owners, a homeschooler! Hello! My name is Becca, and I would like to welcome you to Cinderella's Attic. While I am only 10 years old, Cinderella's Attic has been my dream since I was diagnosed with dyslexia two years ago. Dyslexia simply means that I learn differently. Reading, spelling, and writing are all difficult for me. I also have to practice my math facts over and over, and they are still difficult for me to remember. I am homeschooled, and my mom and I work on all of these subjects as well as history and science every day. While academics prove to be hard work for me, I still enjoy learning new things every day. My family decided to invest in my future by helping me start my own business. I love talking with people, and I enjoy helping people. I also love collecting beautiful old things. I mentioned that one day I would love to open my own an antique store. Two years later we are opening Cinderella's Attic, thanks to lots of help from my family, church family and some dear friends. Cinderella's Attic is all decorated for Christmas and waiting for you to purchase quality vintage, antiques and collectibles. "Christmas tree loaded with beautiful Waterford crystal ornaments and official White House ornaments." "Vintage Moss Ross by Lipper and Mann"
Newport Aquarium invites the public to experience a Cincinnati holiday tradition under the sea Nov. 24 - Dec. 31 at Scuba Santa’s Water Wonderland. Since 2003 Scuba Santa has been delighting children in Northern Kentucky with tons of bubbles, and lots of fun. My girl gets shy talking to Scuba Santa, but has a blast with Tinsel the Elf, you must find him if you visit! Stingray Hideaway New in 2017, visit the tropical paradise getaway where Scuba Santa goes to relax after the busy holiday season. His elves are already there decorating with festive tropical decor ready to meet and greet guests in Stingray Hideaway. Plus, guests can interact with and touch two dozen stingrays in the 17,000-gallon stingray touchpool, while enjoying the tropical holiday oasis. After chasing the swimming penguins back and forth, have giggle of fun, our girl drew a wish on a magic bubble and mailed it to Scuba Santa's Post Office. She also enjoyed getting up close with these guys, they're just so cute! PS. While you're visiting Scuba Santa. Did you know you could Buy 3, Get 1 FREE during their annual pass sale? In time for the holidays, guests who purchase three Newport Aquarium Annual Passes will receive a fourth Annual Pass free. The Annual Pass Holiday Special ends on Dec. 31. Annual Passes are valid for one year from the date of purchase, so guests can use them now to experience Scuba Santa’s Water Wonderland and into next year, including a VIP Passholder-only preview party for the opening of the new Ring of Fire exhibit in March. Driving along I-65 S through Kentucky, it’s hard to miss the giant fiberglass dinosaur sitting atop a small hill at Exit 53. He invites the adventurous driver and family to exit at Cave City, KY and visit Dinosaur World. Reminiscent of the almost bygone roadside attractions, this is a delight to find along the modern interstate. Opened in June 2003, this location is one of three in the United States. Glen Rose, TX and Plant City, FL boast the other two, all owned by the same individual, Swedish businessman Christer Svensson. The main attraction here is the Dinosaur Walk where one will find over 150 life size dinosaurs nestled among trees and other natural vegetation. Signs are posted with dinosaur descriptions and facts. Be sure to walk up the hill beyond the Mammoth Display to have your picture taken with Photosaurus. Other onsite attractions include a fossil dig, boneyard, indoor museum, movie cave, picnic area, playground and gift shop. The gift shop offers everything from a 50 cent plastic dinosaur to an authentic dinosaur egg nest for $3600. Yes, they have sold several, mainly to companies seeking to decorate their offices with that most unusual item. Alice & Wonderland The Musical with the Cincinnati Children's Theatre: Enter to Win! With my oldest child turning fifteen, I'm a beliver in more memories and less stuff more than ever before. We still have a preschooler, who has too much stuff. Don't get me wrong we're still working on it. The older two have too much stuff as well, and I find them downsizing the junk when they start to get overwhelmed. If you were to sit down and talk with them about their favorite things, they'll more than likely tell you about a trip we took, or an event we attended. They both have fond memories of visiting the Cincinnati Children's Theatre, and still like it as a teen and pre-teen. Now they're excited to take along their little sister, and see how she reacts to the scenes unfolding. Since 1924 The Cincinnati Children's Theatre has been aiming to bring smiles and the wonders of the theatre to children across the Greater Cincinnati Area. To kick of their season, they're bringing Alice in Wonderland to the Main Stage at Taft Theatre! Bring your kids to explore their first show of the season, with Alice and all of her friends. Create memories to last a lifetime, and introduce them to the kid-friendly performaces that The Children's Theatre works so hard to bring you. ALICE IN WONDERLAND begins the 2016-2017 season at The Children’s Theatre of Cincinnati, October 15-23, 2016. Saturday October 15 at 2 PM; Sunday October 16 at 2 PM and 5PM; Friday October 21 at 7:30 PM; Saturday October 22 at 2 PM and 5 PM; and Sunday October 23 at 2 PM at the Taft Theatre, 5th and Sycamore Streets in Downtown Cincinnati. Purchase your Tickets $10-30 by calling 1-800-745-3000 or visiting www.ticketmaster.com. Tickets are selling as fast as the White Rabbit! Congratulations to Candy Burns! She is our winner! Disclaimer: I was provided with tickets for my family in exchange for promotional purposes as well as ticket for the winner. All opinions are my own. Father's Day Weekend 2016: Around Town June 17 - 19th. This is just a small sample of what's going on around the Northern Kentucky, Greater Cincinnati Area this coming Father's Day weekend. If you know of something fantastic going on, please feel free to add it to the comments. Friday, June 17, 2016 5 p.m. until 11:30 p.m.
Saturday, June 18, 2016 Noon until 11:30 p.m.
Sunday, June 19, 2016 Noon until 9:00 p.m.
NEW this year at RoeblingFest will be our Historical Presentation series brought to you by BB Riverboats! 2:00 - Dr. Don Heinrich Tolzmann, will discuss John Roebling and his Ohio River Bridge. 4:00pm - Richard Sutherland, PE, will discuss the rehab and restoration of the Roebling bridge in the late 20th century. Check out www.roeblingbridge.org for more details! Have you thought about supporting your local community with everyday products? There is a handmade small business out there for almost anything you could ever want. Let's start today with WinsomeGreen in my home state of Kentucky. It's time to start thinking about your sweetie, and all of the lovely ladies and gents on your list of loves. If you're local to Independence, KY come out to the Valentine's Vendor Fair February 2, 2014. Don't worry, it's over before the game starts! Tis' the season to support local businesses. Now is the time they need your hard earned money more than ever. They're competing with the big guys and most of the time have so much more to offer. Husband and wife team, Justin and Emily Carabello have recently opened their brick and mortar Roasting Works and Craft Coffee Bar in Newport, Ky. They're doing amazing things there, like hand crafting out of this world cappuccinos. I could have stayed there and sipped their delicious brews all day. I can't wait until my summer craving for coffee starts! They're the first to offer cold-brew coffee on draft. I can already feel my taste buds starting to twinge. Visit Carabello Coffee Roasting Works & Craft Coffee Bar at 107 E. 9th St. in Newport, KY. Hours are: Tues. - Fri. 7am - 8pm, Sat. 8a-8p. Not local? Visit their online store. Their brews are a must read! The stories you can tell about your coffee will warm your heart. While you're there, pick up some local coffee for Christmas gifts this year! Your friends and family will love you. If you aren't local to our area you may not know about the devastating tornadoes that touched down in our Tri-State area including Kentucky, Ohio & Indiana (plus many other states). I've never experienced something so close to home. I'm thankful for God's protection over friends of ours who live close and praying for those families who are dealing with the tragedy. There are so many stories of so many familes that need prayer and uplifting during this time. I'm thinking of a little toddler girl who was found in Indiana without her four other family members. She is the sole survivor and still in intensive care. Please keep her in your prayers. For those of you who do live here and are looking for a compilation of ways you can help. I hope to have gathered as much information for you as possible. Please feel free to add anything to the comments section. Monday is a big volunteer day for many churches and organizations. As always, please be cautious and follow up on any organizations asking for money. Northern Kentucky: Coordination of help for Northern Kentucky Vitims of 3.12.12 Tornados Once you join this Facebook Group, be sure to check out the documents link at the top right hand corner of the group page. A lot of information there. 700WLW will be at Matthew 25 Ministries Warehouse on Monday to help collect items needed for Disaster Relief of the Storm and Tornado victims on Monday. Information is on our website at 700wlw.com, search “Events.’ We are linked to Matthew 25 Ministries website if people want to donate money if they can’t make it to Blue Ash in person. Please bring non-perishable food items, water, personal hygiene products, baby items and clothing of all sizes to Lakeside Christian Church, 195 Buttermilk Pike, Sunday March 4th. People in our nearby community are in need of these items due to the recent devastating storms. Lakeside is about loving Jesus and loving like Jesus...let's put that into action! - Walton Baptist Church has all types of supplies available for distribution - just go to the back of the church if you are in need of clothing, toiletries, cleaning supplies, etc.. Distribution will be from 7 -7 on Sunday and then 9 -8 daily. Please pass this information on to those in need. - Nicholson Christian Church located on KY16 will become a clothing distribution center beginning Sunday, March 4th. People in need of clothes should be directed to this location. Thank you. Starting Monday morning 9AM, families in need...please come and get these amazing donations! Family - owned in KY for 30 years. There are so many places to list, so if I missed yours please feel free to add it, again in the comments section. Friends and fellow homeschoolers, the Kalapasevs. Ft. Wright baby fights for life and new heart. For all of you who don't live in Kentucky (Taylor Mill area) please disregard this post or you may get very hungry. New in town is the family owned and operated El Jinete Mexican Grill. If you know me, you know I adore Mexican food. Whether it is Americanized or not, I couldn't tell you, but I love spicy, crunchy and good Mexican food. I was thrilled when El Jinete opened up in my old hometown of Taylor Mill Kentucky. In a small strip of shops, along Old Taylor Mill Road. Surprising to us natives this particular restaurant used to be a Skyline Chili that moved up the sidewalk a bit, into a larger location. The inside has been completely changed, updated and sleek might I add for a strip restaurant. The restaurant was empty when we first arrived, but I think it was due to the random lunch time on a Sunday. (It is also very new). It was extremely clean and the staff was eagerly waiting to serve us. The food, I know you're wondering about the food. Well, I realized that I wanted to write a feature after we had already started to chow so I don't have any pictures for you but I can share our thoughts with you. If you're going to have a Mexican restaurant you have to have good chips and salsa in my opinion. This is key. My husband and I usually rate a Mexican restaurant on the chips and salsa (almost entirely). After all it is the start of what a great Mexican dinner should be. It needs to have flavor, a spice of jalapeno and definitely cilantro. I found all three of these things during our lunch. However, I think the salsa could use just a little more flavor/heat. The chips tasted fresh and were thin and crunchy! The rest of the food was just as delicious. I had the chicken fajita taco salad (yum, with additional hot sauce), hubbs had a beef burrito and enchilada. Both boys enjoyed beef and chicken tacos. All in all, it was a delicious meal at a decent price. We give this restaurant a 7 out of 10. Support family owned local restaurants like El Jinete. What's a good Mexican restaurant in your neck of the woods? Speaking of Growing Something, I haven't even mentioned Earth Week this week! My son is celebrating it at school and we are planting our first garden as a family, I meant to mention it here earlier. So for all of you Kentuckians here's what's going on for the rest of Earth Week in our State. Date and Time: April 22-26, 2008; 10 a.m.-5 p.m. Description: The center will give away free trees to the first 500 families who visit the center on Earth Day (April 22). Numerous activities are scheduled in celebration of Earth Day and National Wildlife Week. For more information: Visit the Department of Fish & Wildlife Resources Web site. Event: Kentucky Historical Society History Zone - "Tree-mendous Kentucky!" Dates and Time: Saturdays in April: April 5, 12, 19 and 26; 1-4 p.m. Description: The Kentucky Historical Society's weekly program, History Zone, is an educational program for children ages five through 10 and their families. In April, the program will focus on Arbor Day and Earth Day. Children can create and decorate a wooden toy from Kentucky's past, plant a tree seed and learn about the importance of trees. For more information: Call Annette Parde at 502-564-1792, ext. 4461. Date and Time: May 6, 2008; 2 p.m. Description: The Kentucky Environmental Education Council will recognize 46 schools that are successfully enrolled in the Kentucky Green and Healthy Schools program. The program encourages students to conduct environmental audits of their school environments and then, based on those audits, implement improvement projects. For more information: Contact Jane Eller at 502-564-5937 or visit the green and healthy schools Web site. Thursday, April 24, Cane Run Creek Cleanup. Lexmark, the University of Kentucky and WLEX-TV are partnering to clean up Cane Run Creek. Volunteers are needed for two shifts during the day to help remove trash and debris from the creek. Saturday, April 26, 10 a.m.-2 p.m., State Botanical Garden of Kentucky, 500 Alumni Drive, Lexington -- Trees for Tomorrow at The Arboretum. Free admission to over 40 exhibitors, hands-on children's activities and free tree and shrub seedlings. Dates and Time: Five Consecutive Tuesdays beginning April 22, noon-1 p.m. Description: Bring a lunch and join a five-week discussion exploring the history and science of global warming, personal values and habits as they relate to climate change, and personal actions to curb the effects of global warming. There will be a $25 charge for the class to cover the cost of the discussion guide and the room. This course is being organized by the Frankfort Climate Action Network and the EPPC Division for Air Quality. Dates and Time: April 28; 6-8 p.m.
Change Committee, which is working to meet the City’s commitment to the US Mayor’s Agreement on Climate Protection. The presentation is sponsored by the City of Franfort, the Frankfort Climate Action Network, the Frankfort Chapter of the United Nations Association, and Envision Franklin County. For more information: Contact Connie Lemley at 502-223-7936 or connie_lemley at yahoo.com. Visit the official Earth Day Page for Kentucky here. Ahhh, those famous three R's Reuse, Reduce & Recycle. Are you doing your part? Do you know about your city's local recycling center? I'm helping readers from my area Greater Cincinnati and Northern Kentucky. Why don't you do the same, post some local links and info from your hometown for your local readers on your own blog! 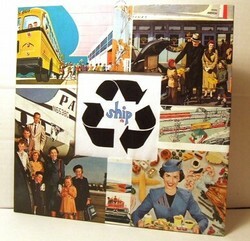 In the meantime today's Daily Swank is a great find for housewares that includes all of the three R's. I'd like to introduce you to the artwork of Rebekah from ship frames by rls . Each frame from this shop is 100% recycled. The frame itself from recycled cardboard and newspaper. 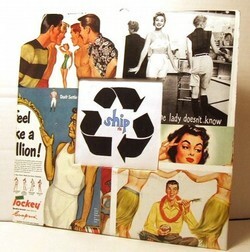 This specific design is also includes Vintage 1950's clothing and undies advertisements! 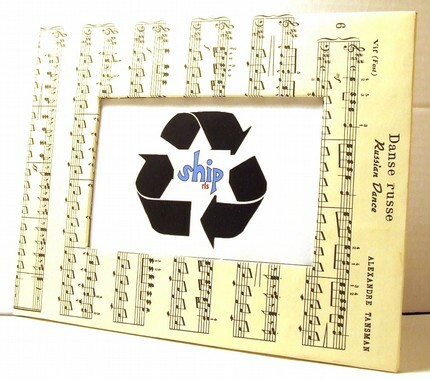 If you are looking for a little recycled chic, I think this Russian Dance Sheet Music Picture Frame is just the thing. Rebekah pulled these music sheets from a found book in her grandfathers attic. I like how each frame tells a different story in her vintage collection. This one sports 1950's Travel Advertisements. 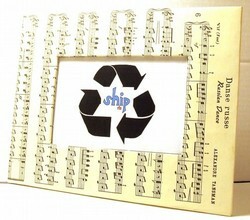 Head over to Ship Frames by RLS for many other recycled designs and uses for recycled materials. If you live in Kentucky here is a little recycling information for you. "Did you know the “three-chasing-arrows” symbol doesn’t necessarily mean a product is made with recycled content or can be recycled in your community? It may just be a reminder for you to recycle. 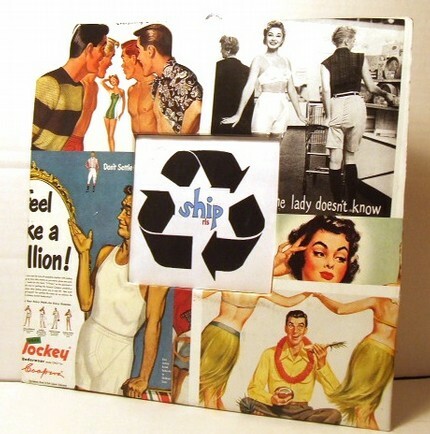 Read the label carefully for specific information on recycled content." (resource Division of Waste Management Kentucky). Earth 911 a great resource for everyone to check out!